You have a message to get out to your clients and customers. Like many others, perhaps you are searching for a solution that is simple yet provides unique capabilities to tailor and deliver your message. Are you a first-time author? Perhaps you are an established author or speaker who is just looking for a better way? Maybe you simply have intellectual property but just don’t know how to package it? Look no further — Motivated Publishing Studios has a legacy of satisfied clients who continue to come back to us… We’d like you to be our next satisfied customer who is so happy with our work, that you pass the word along to others just like you. Providing a complete custom solution (not a cookie-cutter template) for their message. Embracing their project with professional resources for all aspects of their project. Committing to a budget that works within the author’s expectations (no hidden costs). Our capabilities allow an author who still has the idea/concept in their head – all the way to one who already has a fully developed manuscript – to get published. Similarly we have the ability to adapt to the end-needs of the author by providing options for very low print-runs all the way to large quantities. We have provided softcover and hardcover books, with the ability to keep things very simple, or spice them up with the latest printing/marketing techniques. All MPS projects start with an Author’s Agreement, to protect the author and demonstrate commitment by MPS for the execution of the book project. The author always retains 100% ownership and control of their book. Our approach to book projects is to provide one fee for developing the complete book and then provide printing services at cost (MPS does not add a mark-up on printing). This approach means that there are no additional costs for mark-ups or changes – we work until the author is satisfied. 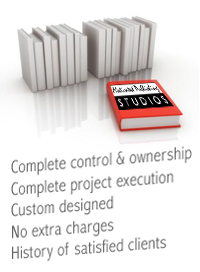 We handle the entire project and provide you a detailed project schedule so you know the flow of how your book will be brought to fruition. This includes all design aspects, interior, cover, ISBN registration and more. Your book will look like no other, customized to your expectations, so that your message gets delivered with motivation. Like most authors today, you may also want to include an e-Book version of your title – MPS can provide you all/any of the modern e-Book formats in use today. From there, you may consider having a website to promote your book and use social media for marketing – perhaps even have you book and e-Book on popular book distribution websites. From idea to printing – Motivated Publishing Studios will help you to become published. If you find your self needing help to get your book in motion, read this insightful article called Are You Planning to Write a Book? Three steps to get your dream in motion!